Home / Opinion and Issues/ Attack on non-conventional renewable energy: Burning the house to kill the lice! Attack on non-conventional renewable energy: Burning the house to kill the lice! You may call this statement an utter nonsense. Well! This is what some self-styled environmentalists are trumpeting on the main stream media regarding the renewable energy development, especially about Mini Hydro Power Projects (MHPP) in Sri Lanka. The MHPP industry of Sri Lanka, which started in the late 1990s became fully fledged and started to export its technological excellence overseas, especially to East Africa, within a decade. A key reason why mini hydro power development opportunity is given to the private sector is economies of scale. It will not be economically feasible for CEB provided it allocates its resources on the development of such small scale projects. The private sector involvement proved that the Non-Conventional Renewable Energy (NCRE), especially mini hydro, can be developed economically and the industry can generate value to all the stakeholders including the local communities, financial institutions and the general public. Most of the mini hydro power plants are located in rural areas. The developers are also compelled to construct or enhance the road access to the sites, which benefits the rural public as well. Further, the developers also give the preference to the local workforce both during the construction and the operation of the power plant. These employment opportunities will help to uplift the standard of living of the rural community directly. Many countries have realised the importance of renewable energy based electricity generation and renewable energy contribution to the increasing global total electricity demand has grown from 19.4 % in 2005 to 23.6%. Though wind, solar and biomass based energy generation is more expensive than coal based electricity generation, geothermal and mini hydro power projects are much cheaper. However, a myth still exists that coal is the cheapest source of energy, which fails to take into account the adverse environmental impact and deprivation of resources for future generations. The United Nations Framework Convention on Climate Change (UNFCCC) identified renewable energy projects which reduce carbon emission and promotes them through its Clean Development Mechanism (CDM). This will help the implementation of the NCRE projects which are marginally viable. About half a dozen Sri Lanka mini hydro projects which were originally not viable obtained CDM accreditation of UNFCCC for their contribution to carbon emission reduction. In this backdrop, it is quite strange to see some environmentalists beating their chests and charging at the entire mini hydro power sector, saying it is the most serious environmental pollutant (forget the other mega projects which completely alter the environment and destroy the local eco-systems). It is also quite surprising that these particular ‘environmentalists’ were in deep hibernation when the protests sparked in Jaffna and the whole populace of the peninsula rallied to safeguard the Chunnakam ground water which was allegedly contaminated by the thermal power plant’s underground fuel storage. Even though civil society from the region was ferociously vocal about the issue, these particular ‘environmentalists’ remained tight-lipped. This article does not claim that mini hydro power projects never damage the environment. The projects require excavation along the hill slopes to construct the civil structures. The project site would contain construction material and equipment. However, once the construction is completed the site would be restored and covered with vegetation. This is similar to how ‘environmentalists’ build their houses on undeveloped land. They also need to remove the vegetation and trees in the premises, excavate to lay the foundation and build the house. However, once the house is built, the ground would be restored with vegetation and trees. Every development activity alters nature to a certain degree. The adverse impact is caused when the activity is not properly planned and executed. In the case of a mini hydro power development, every activity in the project construction needs to be in compliance with the stringent rules imposed by the Central Environmental Authority, Sri Lanka Sustainable Energy Authority, Forest Department, Drainage and Water Board, etc. A mini hydro project needs to obtain approval from more than 10 State institutions before it starts construction. Given there is evidence that a mini hydro power project adversely affects the environment, it should have been identified during the Environmental Impact Assessment and various on-site study by the State institutions prior to issuing approvals. If any adverse impact is caused by the developer, it should be due to violating the rules and regulations and that should be properly dealt by the authorities. 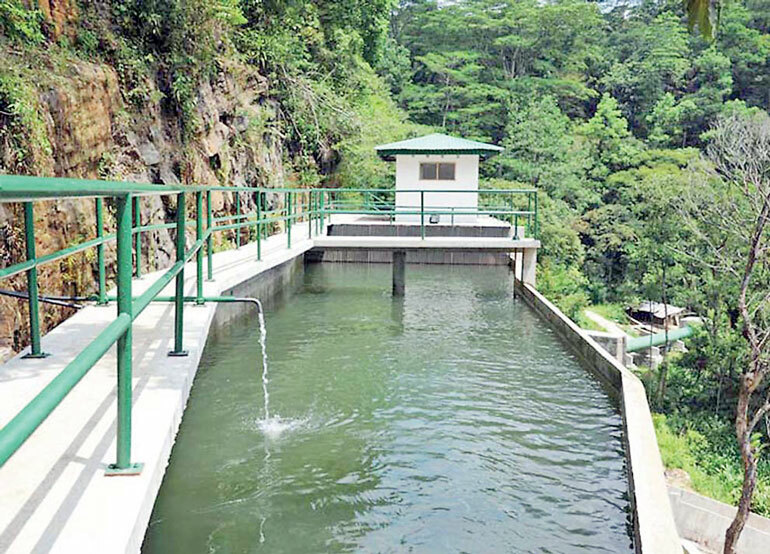 However, it is strange that the particular ‘environmentalists’ blame the entire sector for the issues related to specific project developers and ask to cease issuing licenses for the new mini hydro power projects. In fact, it is highly unlikely that a mini hydro power project developer will meddle with the environment intentionally as nature will immediately punish the developer for any reckless handling. For instance, given the developer does not do the excavation adhering to the guidelines and destroys the vegetation , the likelihood of having an earth slip is high, which can cause huge financial losses to the developer and lead to halting the project construction. It should also be noted that mini hydro power plants depend on rainfall and the flow of the stream as they do not store water like large hydros, thus any activity such as destroying the forests and natural vegetation in the catchment area would reduce the stream flow and in return reduce the electricity generation leading to less financial return. Therefore it is imperative that a mini hydro power developer should adhere to the guidelines issued by the authorities and take initiatives to protect the vegetation in the catchment area. One such example is a mini hydro power developer taking legal action against 328 acres of prime forest reserve being granted to the private party. The private company obtained an injunction against the clearing of the forest land and in 2014 obtained a ruling by the Ratnapura District Court in Balangoda in favour of the plaintiff. This legal action was initiated by the mini hydro power developer as the destruction of forest land would have tremendous impact on the project, and stands as an example how the preservation of the environment is key to the existence and success of mini hydro power projects. Several mini hydro power projects have collaborated with the Forest Department for reforestation initiatives which will protect the soil, geological structure and the streams. The ill-effects of the conventional fossil fuel based electricity generation on the environment and the economy of this country are enormous and the world can use the fossil fuel only for another century, until it is fully exploited. Presently every country has turned its focus on renewable energy generation and gradually increase its contribution to meet the total demand. The Government of Sri Lanka has laid down a policy target of NCRE generation that is 10% contribution to total electricity generation by 2015. This target has been successfully achieved with 11.2% contribution. The industry is poised to achieve its next target of 20% contribution to national electricity generation by 2020, which is quite challenging considering the present level of saturated mini hydro power potential and lengthy bureaucratic approval processes. This information era gives the opportunity to every individual to express their own views, which is an intrinsic aspect of a civilised society. However, an opinion may not necessarily be the truth and the prevailing fact. The venomous propaganda depicting the mini hydro power industry as the most serious environmental pollutant and robbing the natural resources, instigated by certain individuals is based on a self-centred agenda. The public and the media can directly contact the relevant authorities and verify the facts. The NCRE target for 2020 can be achieved only if the State takes concurrent measures and supports NCRE initiatives while strongly passing the message to all the stakeholders that renewable energy is not an option, it is the future.